A recent poll of finance office professionals by Proformative, an independent organization providing professional development for everyone in the office of the CFO, showed that half of those surveyed cite Return on Investment (ROI) as the most important metric in their business case analyses for technology investments, including subscription billing systems, cloud platforms or other significant projects. But, as I have learned in my years of constructing business case analyses and being on the forefront of business transformation to the cloud: this is WRONG! Why is ROI the wrong metric? Return on investment is calculated as the [total net benefits - total costs] / [total costs]. It measures the performance of an investment, but it is missing one key variable: time. ROI does not take into account the time value of money. Money available now is worth more than that same amount of money available at some point in the future. When considering a significant technology investment such as a cloud partner, billing system, or subscription management platform, the time between implementation and the realization of benefits like top-line revenue growth is crucial. In order to take this variable into account, I recommend finance professionals in the office of the CFO, embrace a different metric. As I discussed in the webinar, it is important to rely on multiple meaningful metrics to make informed decisions. One of my favorites, and one I often recommend my clients to leverage is Net Present Value or NPV. Net Present Value (NPV) uses the weighted average cost of capital or WACC to discount potential investment returns to current dollars. While its calculation is less straightforward than that of ROI, it is easily accomplished using any standard spreadsheet productivity tool, such as Excel. Of course, no one, single metric can make or break an investment case. 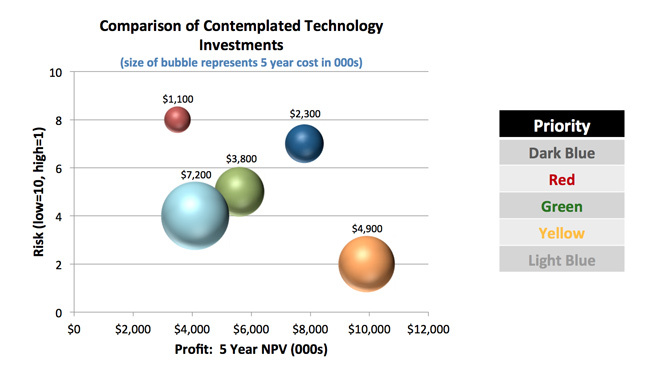 When comparing contemplated technology or cloud IoT investments multi-year NPV needs to be factored with other elements like TCO, risk of implementation and adoption, and strategic fit. How to state the case to drive innovation? It's important for organizations to drive innovation and make smart technology investments at the right time. Faster deployment allows organizations to realize accelerated benefits. It's important to understand your environment. Is there a huge backlog in IT preventing an internal stakeholder from getting a crucial report they need? Understanding the business impacts of that lag time--and including it in the business case--demonstrates how decisions are being hampered because staff don't have access to data. Driving innovation with meaningful business case analysis allows executives to take advantage of the latest technologies and features of cloud and connected ecosystems, while remaining focused on their core competency. By evaluating technology investments with a conservative business case including a variety of meaningful metrics, such as NPV and payback, corporate leaders can ensure they are making the best investment decisions possible for their organizations. If you want to know more about producing a business case for your next cloud, SaaS technology investment, my firm, Technology Finance Partners, has published this report: Calculating ROI for Technology Investments. It includes information about overcoming objections to BCA creation, how to leverage financial metrics in evaluating options and tips for best practices, iterations and post-implementation. For more in-depth details about BCA creations, key metrics and the cloud economy which Mike Murphy and I covered in our recent webinar hosted by Proformative: How to Build a Great Cloud/SaaS Business Case Analysis for Technology Investment, please view the recorded webinar at Proformative's website. Registration is FREE! Or view the presentation materials online. Drew co-founded Technology Finance Partners in 2000. 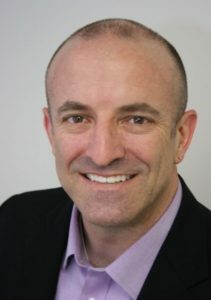 He has worked with numerous clients, including Sun, Alcatel-Genesys, Polycom, Informatica, Autodesk, & AT&T, to drive hundreds of millions of dollars of enterprise technology investment. Drew accomplished this through strategic deal structuring, collaborative business case analysis support and the delivery of value selling sales tools. Drew has been at the forefront of business transformation to the cloud and has spoken at a number of software conferences on the subjects of ROI, green IT, SaaS pricing strategies and customer analytics. Prior to TFP, Drew was a vice president of ADAC Capital, ADAC Laboratories’ customer finance program. His professional career started in the medical device industry where he traveled to 48 of 50 states to see orthopedic surgeons implant custom knee and other joint implants that he designed.